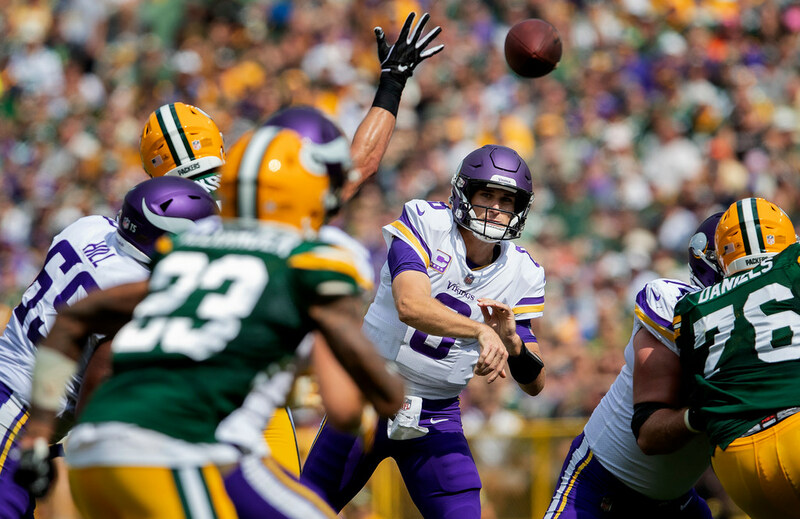 Pro Football Focus recently ranked NFL quarterbacks at what is basically the midpoint of this season, plus an assessment of the Vikings' chances to make the postseason. *Pro Football Focus recently did an overall ranking of NFL QBs at what is basically the midpoint of this NFL season. Some teams have played eight games and some nine (like the Vikings, who finally have their by this weekend), making this a good time to evaluate what has transpired so far at the most important position in sports. As such, the number that sticks out is 8. That is of course the jersey number of Vikings QB Kirk Cousins — and it is also his place in the rankings. While that qualifies as a shade below elite, it puts him in a cluster of very good quarterbacks — one spot behind Tom Brady, two spots ahead of Carson Wentz, for example — and validates the eye test. Cousins, (Aaron) Rodgers and (Patrick) Mahomes each have 18 big-time throws on passes of 20-plus air yards, but Cousins leads the trio in big-time throw percentage (48.6 percent) and ranks second among all quarterbacks in passer rating (136.5) on such throws. Case Keenum — last year’s starter for the Vikings — is No. 25 in the rankings during a mediocre first season with Denver. *Making Cousins’ first nine games even more impressive is the below-average offensive line he’s been working behind. That group ranks No. 29 of 32 NFL teams in similar PFF midyear rankings, though the site did note a minor positive in the adequate play of rookie second-round pick Brian O’Neill at tackle. *Conventional wisdom says the Vikings are on a good path to make the playoffs after winning four of their last five games heading into the bye, but a Football Outsiders piece on ESPN (Insider subscription required) says not so fast. The Vikings are given just a 40.3 percent chance of reaching the postseason, in part because according to FBO’s metrics they’ve played the league’s easiest schedule-to-date and things get much harder post-bye with the second-toughest remaining schedule. The Bears, by contrast, are given nearly an 80 percent chance to make it — even though the teams are bunched closely in the NFC North, with Chicago 5-3 and the Vikings 5-3-1. *Mega-agent Scott Boras took aim at rebuilding MLB teams during baseball’s GM meetings on Wednesday — blaming several teams, including the Twins, for lagging attendance. When “the divisional clubs come to Minnesota, it’s gotten so bad that only one of the Twins shows up,” Boras said. It’s a good line, and he’s not wrong about overall attendance in MLB, which was the lowest in 15 years last season. *The Wolves’ defense has been dismal this season (ranking No. 29 out of 30 teams in points allowed per 100 possessions so far at 114.6), but a sneaky reason for their poor 4-8 start (you know, aside from the dysfunction) is their dip in offensive production. The Wolves were No. 4 in offensive efficiency last season, but that mark is down to No. 16 this year. Two really poor games — including an 81-point offensive output to start this winless road trip at Portland — have no doubt been a drag on things.